The King of Pops frequently has a long line of little ones clamoring for popsicles. 3.Local, raw honey from Canewater Farm. 4.Every time the CH2 crew goes to the Farmer’s Market, they come back with a bag of kettle corn. It’s a tradition…and one of Lucy’s favorite treats. Rainy days do challenge the market, but only in getting the word out that they are open for business. Unless there are high winds or lightning in the area, the selling goes on. The best way to know if the market is happening on any given week is to call the number on the market’s website or check their social media pages. A soggy day can’t hurt the produce; in fact, it’s their favorite kind of day. “They pick the stuff in the rain, they grow it in the rain. It doesn’t bother the produce or us; we’ll be here,” Viljac said. As a member of the South Carolina Association of Farmers Markets and AG South, Viljac works to keep the market up-to-date regarding regulations and legislation happening in the region. 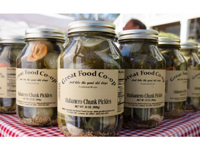 The structure afforded Viljac and the board of directors resulting from these memberships, helps the Bluffton Farmers Market leverage its operation to be able to provide opportunities for local non-profits, schools, and organizations to share their messages, promote events, and fundraise. Non-profits are welcomed and given space to share their missions and to do a bit of fundraising. Sometimes it’s a local baseball team raising money for a state championship trip. 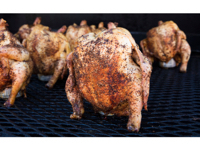 Slow-roasted beer can chicken available at the Market. 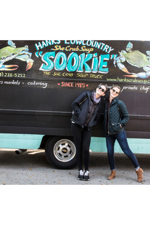 CH2 Catherine and CH2 Hunter strike a pose next to Sookie, the she crab soup truck. Other times it may be an animal shelter, or EMTs, or a local theater. “We call it ‘Broadway on Calhoun.’ We’ll set up a stage, and the group will do a preview of their show so that everyone in the community knows about it. 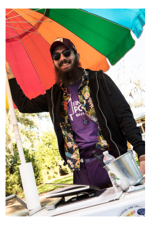 “One of the great things about a farmers market is that it gives people a chance to start a business,” Viljac said. “Maybe they can’t afford a storefront or a brick and mortar building; this gives them a place to try out their goods, to grow things and make things, and test the market. A lot of people end up with a storefront. Sometimes they leave me, which I love to see. They need a jumping-off platform to get going. 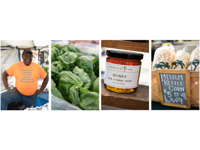 All farmers markets do that for small businesses.” The first Thursday of the month, the Artisan’s Showcase may be found at the market as well—another opportunity provided to those starting out or working to start a business, this time for handmade arts and crafts. 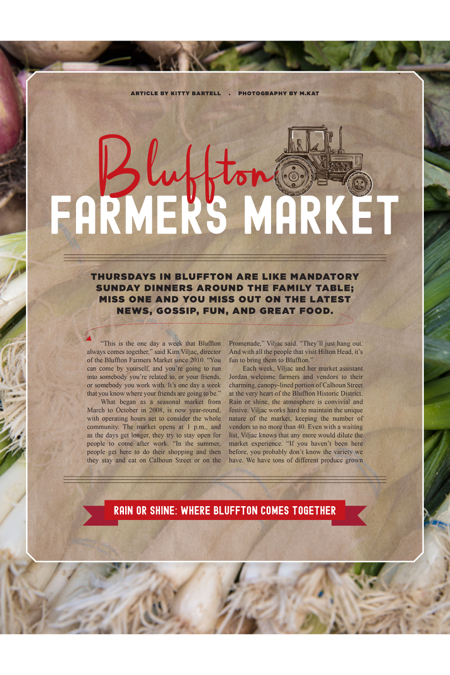 Operated by a small staff and volunteers, the Bluffton Farmers Market relies on corporate sponsorships, private donations, and grants awards. 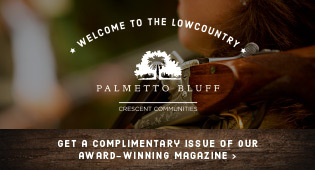 For the second year, Montage Palmetto Bluff is the market’s premier sponsor. 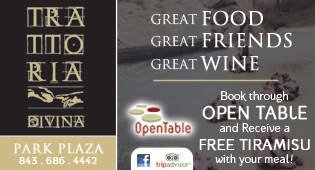 “They come out every third Thursday of the month and do ‘A Taste of What’s Cooking at …” Often it’s Buffalos, sharing their outstanding food and letting people know they are open to the public. 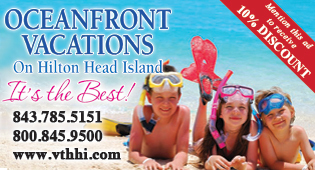 Other sponsorships are available on a weekly basis, as well. 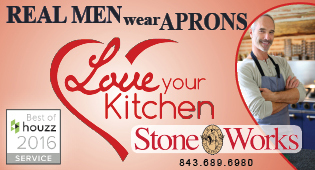 For more information, please visit farmersmarketbluffton.org, follow them on Facebook, or call (843) 415-2447.